New Nordic's Ear Tone is a unique formula based on herbal extracts and minerals, that may help to reduce the perception of tinnitus while promoting the microcirculation. Ginkgo (ginkgo biloba) (leaf) 50:1 24% flavonoid glycosides, 6% terpene lactones 50 mg.
Magnesium (magnesium oxide) 266 mg. 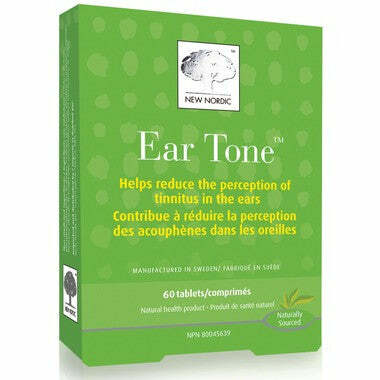 Helps to reduce the perception of tinnitus in the ears. Consult a health practitioner ff you are taking medication that affect blood coagulation (e.g. blood thinners, acetylsalicylic acid, ibuprofen, fish oils, vitamin E) as this may increase the risk of spontaneous bleeding. if you have diabetes or if you are taking medications for diabetes, high blood pressure (antihypertensive medication), seizures, or, supplements, antacids and/or laxatives containing magnesium. If you experience symptoms of hypoglycemia including feelings of anxiety, dizziness, tremor, sweating, nausea or headache, discontinue use and consult a health care professional. Do not take if you are allergic to members of the Pinaceae plant family or have a kidney disorder. Some people may experience nausea and abdominal cramps. Do not use if you are pregnant or breastfeeding. Consult a health care practitioner prior to use. Adverse reactions: Some people may experience diarrhea. Do not use if blister package is broken. Keep out of reach of children. Adults: Take 2 tablets daily with any meal. You can expect results generally within 6 to 8 weeks of use. The founders of New Nordic, Marinus Blaabjerg and Karl Kristian Jensen, set a goal to create innovative and effective natural products. New Nordic manufactures natural products for enhancing vitality and promoting an active life, in people of all ages. The products are refined, analyzed and tested under controlled conditions.